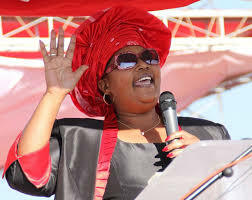 Expelled MDC deputy president Thokozani Khupe has opened new party offices in the Bulawayo central business district. As her split with MDC president Nelson Chamisa became imminent last month, a faction led by Khupe took control of the party’s Bulawayo provincial offices, but was ordered to vacate by the High Court. While the Khupe camp complied with the order, yesterday her personal assistant Witness Dube confirmed occupying new offices. “Our use of new offices in town is a measure we had to take especially for preparing for congress since Bulawayo is the hosting province,” Dube told Southern News. “After our 21 April extraordinary congress, we will definitely revisit the Chamisa cabal’s usage of our party offices ahead of a congressional and Constitutional acting president of the MDC-T, Khupe, whom we expect to be affirmed as the substantive president of our party,” he said. Their new offices are on the first floor of Centurion building, corner 9th Avenue and Herbert Chitepo. Khupe, organising secretary Abednico Bhebhe and party spokesperson Obert Gutu were expelled from the MDC last month for defying a national council resolution endorsing Chamisa as president. Her allies dismissed the expulsions as null and void, instead, opting to go for an elective congress that is ostensibly meant to elect the former deputy prime minister as substantive MDC leader. As if that is not enough, Khupe, Bhebhe and Gutu were expelled from Parliament after being recalled by the party. As a result, they ceased to represent the MDC and its interests.